Linn Selekt DSM review | What Hi-Fi? There was a time when single-box just-add-speakers systems were compromised budget affairs. They were aimed at people who didn’t want the complication (or cost) of separates and were willing to put up with the significant shortfall of performance that resulted. The most capable of this breed was one of Denon’s DM micro systems, which would typically set you back a couple of hundred pounds and still sound pretty good. If you wanted something that sounded better, but was just as convenient, there was no real option until the arrival of Linn’s Classik about 20 years ago. This was a one-box system that originally packed a CD player and amplifier, but later went on to add a tuner and even multi-channel capability. It was the product of a staunchly premium brand with a back catalogue of high quality, high priced and fine sounding separates components. All that gave it plenty of credibility in the eyes of those who might normally ignore all-in-one solutions such as this. Despite a distinctively premium price for the time – the Classik cost around a grand back in 1998 – it was a huge hit thanks to its neatness and inherently fine sound. It probably wasn’t good as carefully chosen separates at the same price, but was close enough so that those who took the plunge were still satisfied, and cemented its appeal with an unimposing, fuss free nature. Seeing Linn’s success, rivals started to get in on the act, and ultimately the likes of Arcam and then Naim began to dominate the market that Linn created. It’s taken a while, but we think the new Linn Selekt DSM moves the game on yet again, not only when it comes to performance but price level too. What exactly is the Selekt DSM? It’s a modular product that can be tailored to taste, with the basic version available for £4000 ($5200). This gives you a high-end steamer and digital preamp in a single box. Highlight features include network streaming, embedded Spotify, Tidal and Qobuz streaming services, and even the option of Apple Airplay. It’s Roon ready too. There are five digital inputs including a HDMI ARC for connection to a television and USB for a computer. The world of analogue hasn’t been ignored either, alongside the single line level input you’ll find dedicated sockets for both moving magnet and moving coil cartridges. Given Linn’s incredibly rich record playing heritage, the inclusion of both options is no surprise. In basic streamer/preamp guise the Selekt DSM sits between the company’s entry-level Majik offering and the distinctively premium Akurate product. But with an all-new modular design, it’s aimed at a different audience. Right now there are two options for modules (or cartridges as Linn calls them). You can upgrade from the capable 24-bit/192kHz DAC section to Katalyst spec for an additional £1500 ($1895), which lifts the sound quality considerably or/and add a Class D 50W per channel (into 8ohms) stereo power amplifier module for £1250 ($1580), as in our review sample. You’ll often see a power figure of 100W per channel quoted for this amplifier. That’s its output into 4ohms, and the doubling of power shows that this design is unlikely to be upset by more demanding speakers. The choice of add-on modules doesn’t end there. There are plans for a surround sound module. 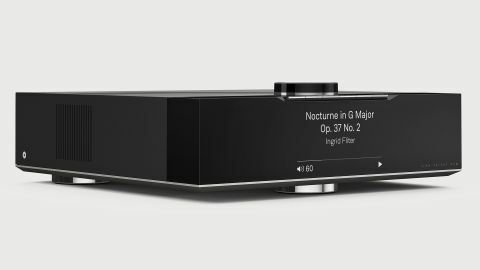 Expect it to have power amplification for five speakers (and a subwoofer line level output) as well as four HDMI inputs, one output and support for DTS and Dolby Digital Plus codecs. Also expect to see Bluetooth and dual-band wi-fi (2.4/5 GHz) soon too. It is a surprise that both of these aren’t supported from the off, though. Most products of this type, even at budget levels, have them as standard. Linn’s engineers have worked hard to integrate the modules in a way that doesn’t spoil the Selekt’s performance. Signals are transferred digitally throughout the circuit to reduce degradation and noise, even those that start off in the analogue domain, and the power supply is generous enough to deliver the punch and dynamics expected from a product at this level. Linn has taken advantage of this being a ground-up new product by developing a new dual-core processing engine that should be capable of coping with a decade’s worth of progression. This powerful new brain also makes it possible for the company to include the latest version of its Space Optimisation room equalization software. The original version of this software debuted in 2015, but this latest version is an intriguing and more complex alternative to the kind of mic-operated auto equalisation systems we’re used to seeing on modern AV amplifiers. While some users could get decent results, it needs training and experience. The new version can work with any shape of room, no matter how uneven. It will accommodate the effects of windows and doors, and even the changes in air pressure due to temperature fluctuations. Space Optimisation also takes into account the behaviour of your speakers. Linn has built-up a large database with the detailed measured results of a wide range of speakers, including their electrical characteristics as well as physical aspects such as the distance of the drive units from the ground. This information, plus all the data of the room’s walls and construction, is crunched and the DSM’s output tailored accordingly to deliver what Linn feels is the optimum sound. Clever stuff. Physically, the Selekt DSM is a smart unit. It’s well made and neatly finished. That dial on the top panel is more than just a volume control. Pressing down on different parts gives access to basic controls such as skipping tracks or pausing. It does feel a little vague when doing this, but works well enough. There’s a row of buttons below it that can each be assigned a particular task. It could be a shortcut to an input or even a specific track on one of the streaming services. These buttons are easy to set and control, and while we’ve seen this kind of thing before it really makes the Selekt easy to use. Some may be surprised at the lack of a full colour display. The Selekt DSM’s closest rival, the Naim Uniti Nova (considerably cheaper at £4,199) has one. Linn wanted to avoid the visual distraction when listening. The OLED display is certainly crisp and large enough to be read from the other side of our test room. This is an easy system to use, especially considering the range of sources available. You’ll need Linn’s Konfig app to set-up the product to taste and then the Kazoo app to control it. There’s also a physical remote for those that prefer one. We certainly found it easier to control basic things like volume from the wand rather than the app. We start off using the Selekt DSM’s network capabilities and are impressed. Linn has been making streamers longer than most and that experience shows. The Selekt is as slick and seamless as they come, swapping between our reference Naim NAS and Tidal account seamlessly. The Linn’s sonic character won’t surprise anyone familiar with the company’s products. Its presentation is crisp and taut, trading the last ounce of sonic richness for an enviable sense of control. We listen to a range of music from Stravinsky’s The Rite Of Spring to Beyoncé’s Lemonade and the DSM delivers an agile and precise sound. It has a surprising degree of agility and can track complex musical strands with ease and composure. There’s plenty of punch too, so with tracks such as Beyoncé’s Sorry, it has no trouble thumping out the beat at high volume. That power figure of 50W per channel may seem modest, but even through relatively inefficient speakers such as our reference ATC SCM 50s (85dB/W/m) it produces plenty of volume. Naim’s Uniti Nova certainly has more in the way of sonic richness and fluidity, but the Linn earns its premium when it comes to outright clarity and punch. We play around with the Space Optimisation feature too. Even in our relatively well-behaved test room it has obvious benefits in terms of low-end detail and agility. Things just seem clearer and better controlled in the bass once the room effects are compensated for. There is a slight loss of rhythmic flow, but we suspect that in many normal rooms it will be worth the sacrifice. We move to the digital inputs and continue to be impressed. The optical and coax show the standard on-board DAC to be a good one. It’s a balanced and insightful performer that works well across the board. We’ve heard the upgrade Katalyst module and there’s no denying that it’s even better, but at £1500 more it’s not an essential purchase for most. We’re less pleased with the USB input. Linn has taken a long time to include such an input on its products but the USB doesn’t have the same sense of stability and clarity as the others. It’s perfectly usable, but not outstanding. Much the same applies to the sound using Apple Airplay. If you must, it’s alright at best. We return to positive ground with the built-in phono stage. We connect a Rega Planar 3/Elys 2 to the moving magnet input and our reference Clearaudio Innovation Wood record playing package to the moving soil. In each case the phono module sounds detailed and expressive, keeping the fine qualities we note from the other inputs. The analogue line input is equally talented, especially considering that it has to go through an extra analogue to digital conversion in the signal path. There’s no denying that Linn has aimed high with the Selekt DSM. Its price, once the power amp is added, is a way higher than its most obvious rival and not far short of Cambridge’s brilliant and classy two-box Edge streaming preamp/power combination. At £6000, the Edge pairing has undeniably superior sound, delivering a sense of scale and authority the Linn just can’t match. But, some will always want just one box and the Linn’s compact dimensions will get it onto shopping lists where the Edge won’t get a look in. The Selekt DSM is also upgradable, and good enough to impress on its own terms. If you want a top-end integrated box of electronics this is one, alongside its Naim rival, you really must consider.